There’s nothing “horrible” about the JCPOA deal, plenty awful about Trump pulling out. His deplorable action came as expected – added proof that Washington can never be trusted. Dealing with whatever regime is in power is hazardous, a lesson learned repeatedly over time, Tuesday the latest example – a day that will live in infamy like many others in US history. World geopolitical conditions are now more precarious and hazardous than before – more unstable, risking US-led naked aggression against Iran, depending on how events unfold. Trump’s withdrawal had nothing to do with “prevent(ing) an Iranian nuclear bomb,” as he falsely claimed – everything to do with escalating political and economic war on the Islamic Republic by reimposing nuclear-related sanctions, new ones to come, notably targeting its energy, petrochemical and financial sectors. In its annual assessments of Iran, Washington’s intelligence community cites no evidence of a military component in Tehran’s nuclear program – or anything suggest it seeks one. Ten IAEA inspections of Iran’s nuclear facilities affirmed full JCPOA compliance, the Islamic Republic fully cooperative with agency monitors. US and Israeli accusations about the deal giving Iran billions of dollars for terrorist related activities is a bald-faced lie. So was Trump saying withdrawal protects America from a bad deal. Just the opposite is true. So-called “malign” Iranian behavior refers to helping Assad combat US-supported terrorists in Syria, along with its diplomatic relations with predominantly Shia Iraq, Lebanon’s Hezbollah, and other regional governments – legitimate behavior, nothing “malign” about it. Trump saying he’ll impose the highest level of sanctions on Iran is bad news for world peace and stability if EU nations and their enterprises observe them. 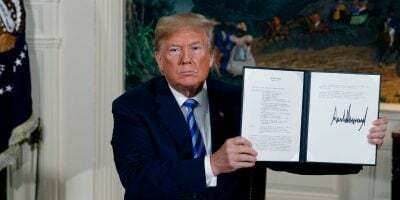 P5+1 nations vowing to stick with the JCPOA despite Trump’s withdrawal is meaningless unless they publicly reject new US sanctions on Iran, refusing to observe them, along with enterprises in their countries continuing normal business activities with the Islamic Republic. The same goes for at least most other key nations in Europe and the world community – what’s highly unlikely to happen. Rejecting Trump’s action and others to come against Iran is the only way to neutralize illegal US sanctions, rendering them ineffective, maintaining the JCPOA as an international treaty. Following Trump’s Tuesday announcement, Britain, France, Germany, and EU political chief Mogherini expressed strong support for the JCPOA, saying nothing about refusing to observe new US sanctions surely coming. What’s most important they’ve been silent on so far, appearing to want things both ways – sticking with the JCPOA while letting Washington kill it by signaling likely compliance with reimposed US nuclear related sanctions and more surely to come by the Trump administration and Congress. The lesson for Iran, Russia, China, North Korea, other sovereign independent nations, and rest of the world community is clear. Dealing with Washington diplomatically is fruitless, counterproductive, and hazardous to nations pursuing this course with a nation bent on world conquest and dominance – wars of aggression, color revolutions, political assassinations, and double-dealing its favored strategies. Trump is the latest in a long line of US leaders pursuing its destructive imperial agenda – begun during the earliest days of the republic, continuing today with super-weapons in the hands of warlords willing to use them against any nation challenging its hegemonic aims. Today is the 73rd anniversary of Soviet Russia’s Great Patriotic War triumph over Nazi Germany – over 25 million of its soldiers and civilians lost in the epic struggle. Another global war could doom us all, things ominously heading in this direction if forceful enough action isn’t taken to prevent it. Trump’s disgraceful JCPOA withdrawal represents a shot across the bow for what’s likely to come – a threat to world peace too great to ignore.